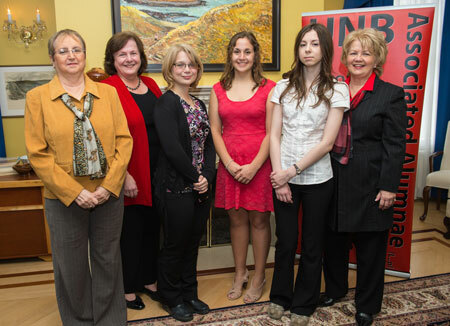 This year's UNB Associated Alumnae award recipients ranged from future biochemists to teachers and everything in between. The Alumnae recently held a luncheon to congratulate this year's student award winners and to remember the women who made these awards possible. Karen Taylor, president of the Associated Alumnae Council, spoke at the event saying that it was very special day of celebration, recognition and reflection. "The luncheon is a celebration of these women's accomplishments as scholars; a recognition of their achievements as members of the University of New Brunswick family and their achievements as community volunteers," said Taylor. "It's also a time to reflect on the contributions, foresight and tenacity of those trailblazing women who in 1910, formed the Alumnae Society. I'm sure these women would be just as impressed as I am with not only with the scholastic achievements of these students, but also their involvement in university organizations and in their communities." Thanks to women like Taylor, after 102 years the Associated Alumnae is still going strong, promoting opportunities for learning and networking, assisting women students financially, advocating for women and contributing to the advancement of UNB. Brittany LeBlanc, winner of two awards presented by the Alumnae, says the money she received allowed her to give her full attention to her studies. "I'm paying for my education through student loans, so without this support, I would be forced to borrow more, or pick up a part-time job," said LeBlanc. "I work two jobs during the summer, so I feel very fortunate to be able to focus solely on my studies during the school-year." LeBlanc, from Moncton, N.B., is in her third year of kinesiology and plans to pursue education or physiotherapy upon completion of her degree. The Associated Alumnae awarded more than $21,000 in scholarship money to women students this year. Taylor says she hopes to see this number grow. "This scholarship program not only helps female students achieve their education goals, it provides them with a window to become involved with the Alumnae," said Taylor. "These students are the future active members of the Alumnae, and I hope they carry on with their lives and careers with the same sense of purpose, tenacity and love of UNB, that our founding members had so many years ago." This year’s event was hosted by Alumnae supporter, Diane Campbell, at Somerville House. A complete list of the winners is listed below. For media requests, contact Natasha Ashfield.